The compact, surprisingly versatile home fitness device, is essentially a portable elliptical machine with built-in resistance training. Unlike other mini step machines, our twist action helps you tone thighs and buttocks, while achieving a challenging cardiovascular workout; works deep muscles in hard-to-reach places without putting stress on joints. Heavy-duty steel construction provides years of reliable use; oversized, slip-resistant foot plates keep you firmly planted during workout. On board computer with LCD display shows total count, time, calories burned, and rep count. 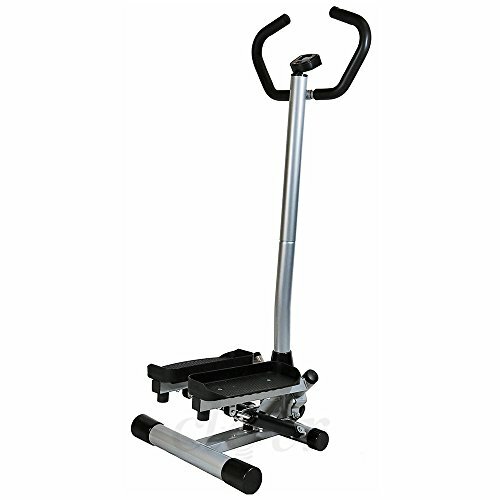 LCD monitor tracks workout statistics, Sturdy steel frame, Maximum user weight capacity is 250 lbs. Materials: Steel Materials Dimensions: 17.3"x19"x50"